Our apartment is located on the First Floor of a Private House inside the historic center of Montepulciano. It is at the beginning of the town center. It has been updated, but its Tuscan characteristics have been kept. It has Air Conditioning and is decorated with new furniture, such as new large sofa in Living Room, new mattress in Large Bedroom, ceiling fans in Living Room and Bedroom, new bathroom, new soft linens, and new soft plush towels. Large Kitchen is stocked with pots, pans, dishes, glasses, coffee machine, toaster and spices. It has a comfortable dining table that can accommodate 4 people.The apartment can sleep 4 people. You can easily walk to several restaurants, cafes, supermarketshops, Churches and Wine Cellars inside the historic center. My husband and I love living in Tuscany. We live in one of the most beautiful areas of Italy. We get to enjoy the culture, great people, great food and of course the best wines. We are enjoying this Hospitality Venture we took on a few years ago. We get to meet some wonderful people from all over the world. Apartment has a great location from which you can easily walk to cafes, shops, supermarket,restaurants and so many beautiful sites. The Sasso Language School is about a 5 to 6 minute walk from the apartment. 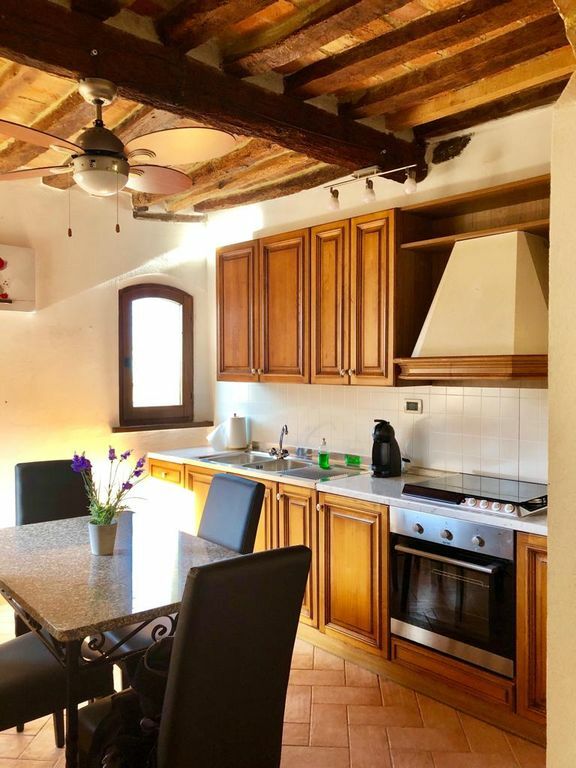 It is also a great location from which you can easily visit several other Tuscan towns such as Pienza, Montalcino, San Quirico D'Orcia, Bagno Vignoni, and the city of Siena. We provide a drying rack to dry clothes on. Kitchen has pots, pans, dishes, glasses and some spices and oil. Old and romantic on the outside and very contemporary and well furnished on the inside. Limited, but great views.